WELDON, N.C. – Halifax Community College (HCC) was proud to host the spring induction ceremony for the P.R.I.D.E. Male Mentoring program. P.R.I.D.E. stands for PReparing men for Intellectual, acaDemic, & Educational success. The induction took place on March 22 at 12 p.m. at The Centre@HCC. Students processed in and were greeted by Daniel Lovett, director of P.R.I.D.E. for HCC. After a recitation of the program credo by Sinclair Nicholson, and an invocation by Ray Renn, the speaker for the event was introduced. Brian Williams, an HCC graduate and a P.R.I.D.E. member, gave the words of inspiration. Allen was born and raised in Roanoke Rapids, and earned his Associate in Arts from HCC in 2010. Upon graduation, he transferred to Winston-Salem State University where he earned a Bachelor of Science in Management Information Systems in 2013. While attending WSSU, Allen was a member of Black Men for Change Male Mentoring program and became a member of the Alpha Phi Alpha Fraternity. He now resides in Charlotte and works as a computer programmer and analyst for Piedmont Natural Gas. He and his wife, Dianna, have one daughter with another daughter due later this year. After each of the new and returning members received their certificate of membership, special recognition was given to two faculty members who have been supportive of the program throughout its existence. Eric Pullen, principal of the Roanoke Valley Early College, and Jason Shotwell, an industrial systems instructor at HCC, were both recognized in front of the crowd for their commitment and service. Finally, all members, current and newly-inducted, recited the P.R.I.D.E. credo together before closing the ceremony. The P.R.I.D.E. 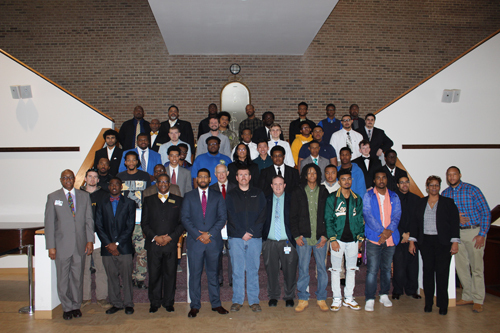 of Halifax (PReparing men for Intellectual, acaDemic, & Educational success) is a college success, leadership, and professional development program designed to enhance student satisfaction, professionalism, retention, graduation, and 4-year college transfer rates. P.R.I.D.E. fosters partnerships between students, learning coaches (success coaches trained in mentoring, counseling, developmental advising, instruction, career exploration, financial planning, etc. ), faculty, staff, professional mentors, and the community.